No cameras and video cameras will be allowed. Photography and videography of the concert is not permitted at all times. We reserve the right to ask patrons with cameras to leave the camera batteries at the battery deposit counter where RITS will not be liable for any loss or damages. Outside food and drinks are not allowed. No smoking is allowed within the venue. No backstage access is allowed at all times. No umbrellas will be allowed into concert premises. 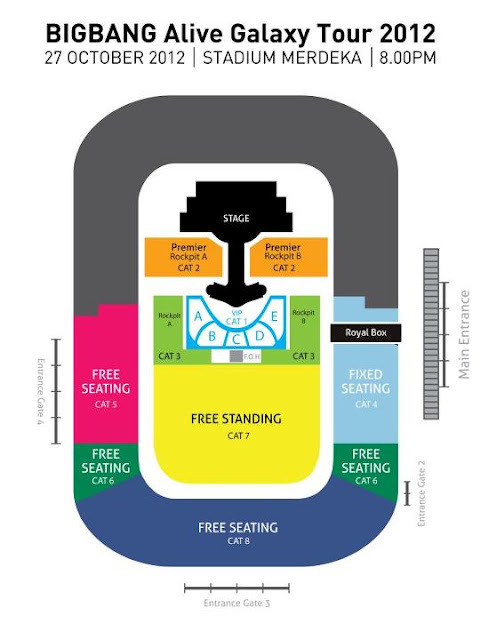 BIGBANG Concert merchandise can be purchased at the merchandise booth, located at the Main Entrance. Public will be able to enter the concert venue from 5pm onwards. Overnight queuing is not encouraged for safety reasons. The concert is a rain or shine event. Please come prepared with your own raincoat, ponchos or hats. For patrons who have purchased tickets via TicketCharge and have opted to collect tickets at the door; please proceed to Main Entrance for your collection. Collection starts from 12pm. For patrons who have purchased tickets via RedTix and have opted to collect tickets at the door; please proceed to Entrance 4 for your collection. Collection starts from 1pm. Complimentary, Partners and guest list invites, please proceed to the Main Entrance for your collection/ entry. Collection starts from 4pm. Members of the public who wish to purchase tickets from Ticket Charge can visit the Ticket Charge counter located at the Main Entrance. Members of the public who wish to purchase tickets from Red Tix can visit the Red Tix counter located at Entrance 4. The main parking area of Stadium Merdeka will not be accessible to the public. Please find alternative parking arrangement. The closest monorail station is Maharajalela. The other landmark near Stadium Merdeka is the Stadium Negara.